The mechanical, thermal and electrical performance of engineering thermoplastics enables their use in a wide array of demanding applications. From aircraft engines to cryogenic pumps, engineering thermoplastics have advantages when compared to materials such as metals and thermoset composites. Tri-Mack can help you pick the best material and design for your application. Thermoplastics provide a significant weight reduction when compared to metals, up to 70% versus stainless steel. Glass and carbon reinforced thermoplastics can match or even outperform metals. Injection molding and thermoforming enable the efficient processing of complex shapes, providing engineers with more flexibility when designing components. This design flexibility can also be used to reduce part counts through consolidation. The inherent plastic properties, such as corrosion resistance, may be the right fit for your application. Performance can be further enhanced by using tailored compounds. These thermoplastic compounds contain additives that enhance properties such as mechanical strength, impact resistance, chemical resistance, friction-wear resistance, electrical conductivity, etc. 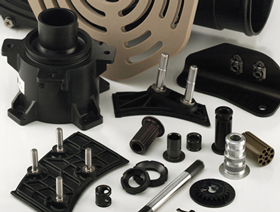 Thermoplastics provide direct and indirect cost savings. A key benefit of thermoplastics is their low cost of conversion. We start with pellets and produce complex geometry with a cycle time that is measured in seconds. Complex shapes can be made efficiently and quickly. Thermoplastics also add value through the enhanced performance of your product. Contact Tri-Mack to learn how thermoplastics can help you succeed.